Oh yes, and this one too, brought forth from the back burner, from the beginning of May. I have since sorted out the pattern improvisation disaster from the beginning, in this post of several months back ~ here . I’m really enjoying how the colors are working, and how the pattern borders are beginning to contrast from the previous border. So fun! 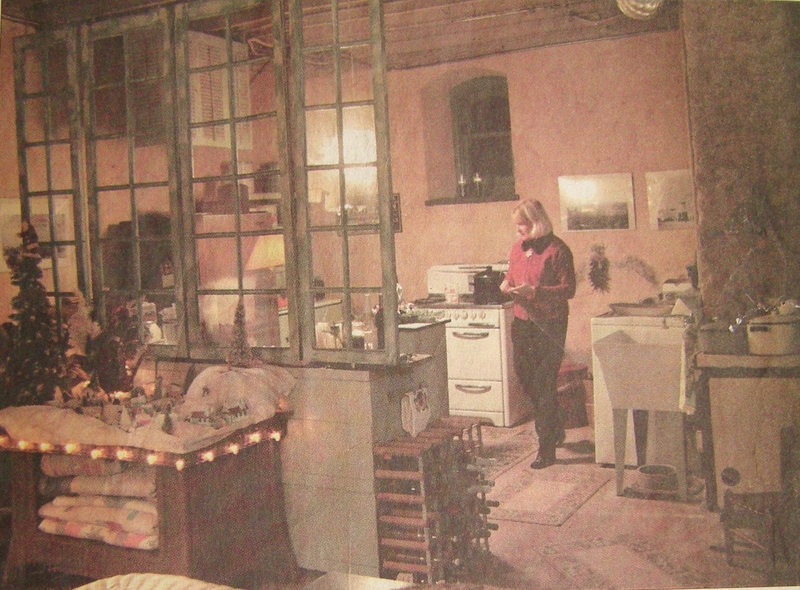 I decided that to stray from the pattern’s borders, peeries, and color sequences was courting disaster. Even though I always seem to have an overwhelming impulse to substitute (as in cooking), knitting is perhaps a little less flexible. 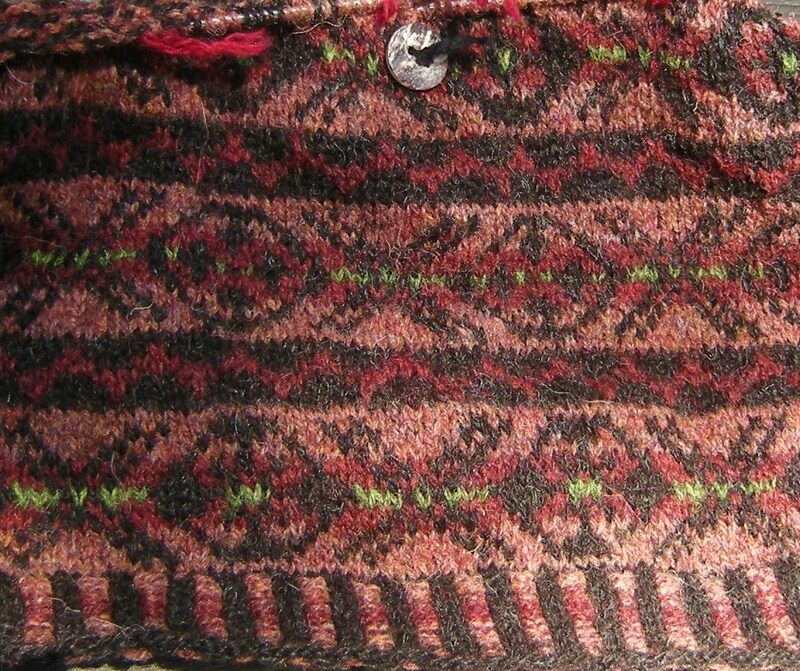 It’s always a valuable learning experience about just how far I can deviate from the author’s pattern or colorway. I’m one of those who very rarely has stuck completely to a pattern (or cooking recipe). I ended up becoming quite unattracted to the alternate color sequence and peerie which I originally started to substitute in the first attempt at the Lichen Waistcoat in this post , reason being that I didn’t want to introduce a fifth color which would detract from the ‘sparkle’ of the bright green center in the borders, an accident which I found unexpectedly perfect. I just wanted that green pinstripe to stand alone. That’s not too hard to understand, is it? I soon ripped back to the first border and settled in to the author’s pattern, and now happy enough with my own colorway at least, being completely infatuated with the pair of Virtual Yarns “Red Deer” and “Mountain Hare” colors, of the Hebridean Moor & Mountain color story, and well, the soflty neutral Jamiesons Spindrift “Natural Black” is a very nice choice for the motifs I think. I am now back on course with this project. 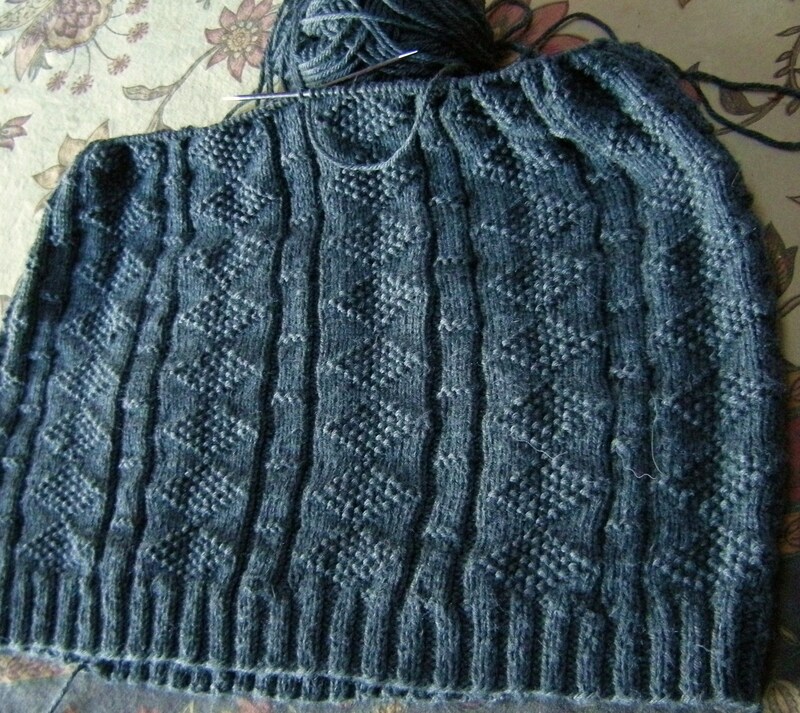 It however, is near the back burner as there are four other projects which have seemed to make their way into my priority knitting. I will have this well under way if not finished, in the Autumn of this year… or am I kidding myself ? 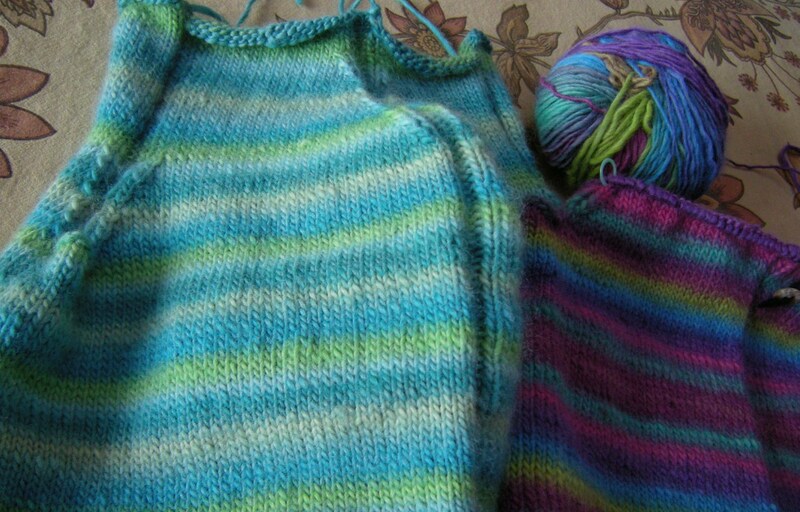 Nearing the finish of the two bodies of vests for nieces. Can you see the steeked front and sleeve holes? 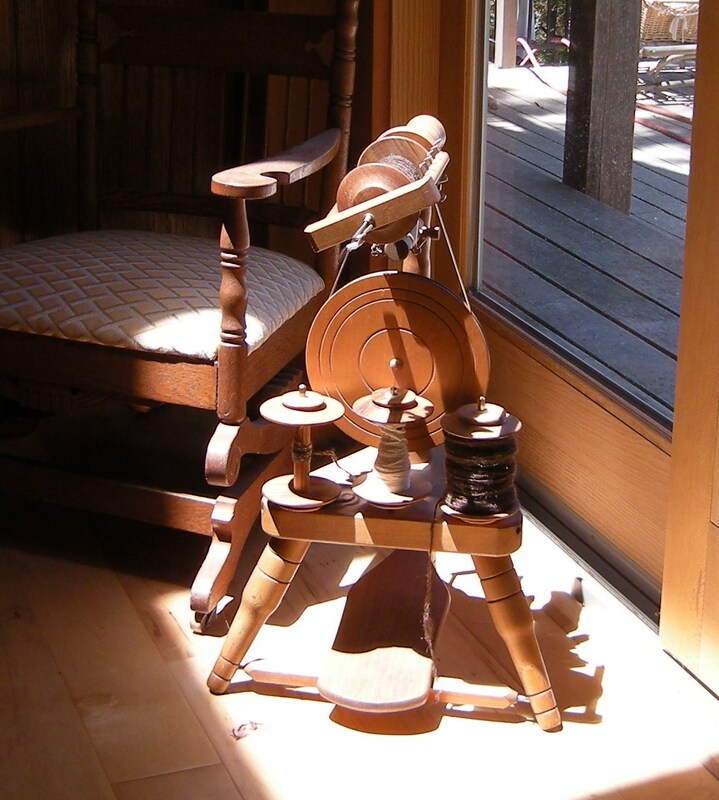 (For those of you who are wondering, steeks are extra stitches made into the round of stitches, to be cut open later, allowing the body to be knit uninterrupted in knit or patterned stitches). So far , this is my 3rd project involving steeks, and I am only now *just* getting the hang of it. Note: After this project for the nieces, I think I will be quite unlikely to knit self-striping yarn for a while, it’s just so ‘been there-done that’ kind of experience. 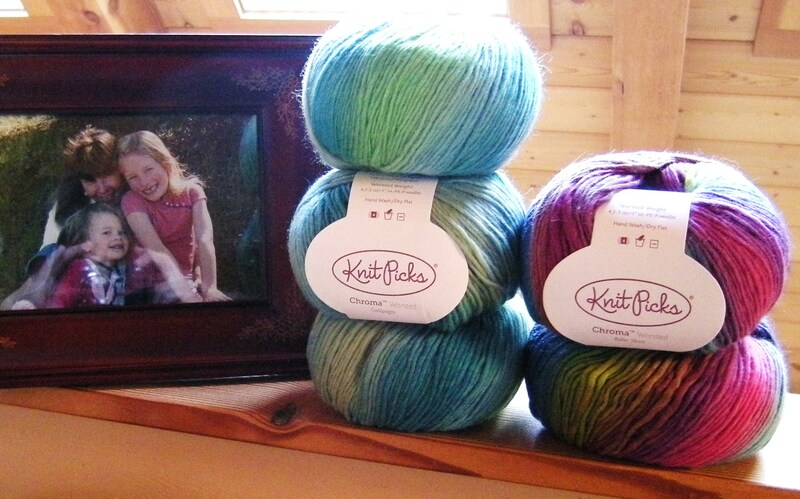 Vivid, cute, in their favorite colors, but I won’t be in a hurry to knit another self-striping yarn project. 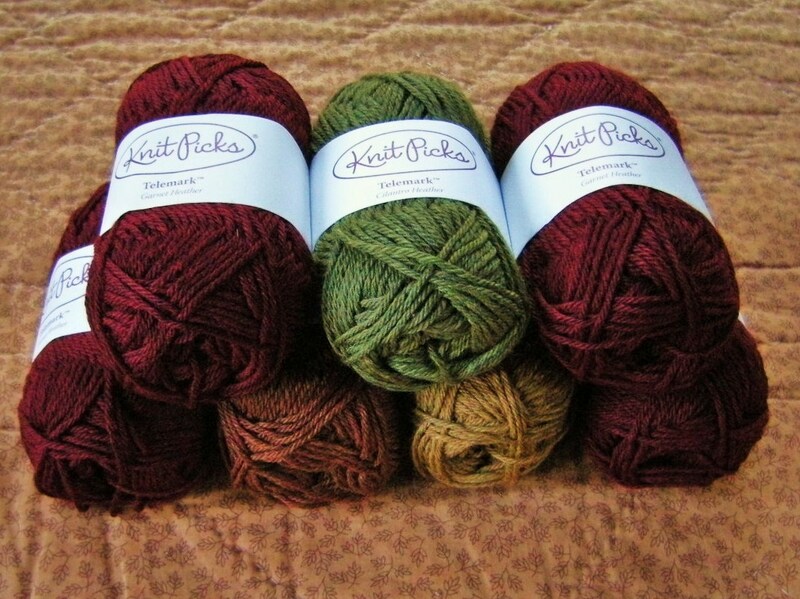 Meanwhile, this just showed up, a box full of one-hundred-percent wool yarn for my next project ! 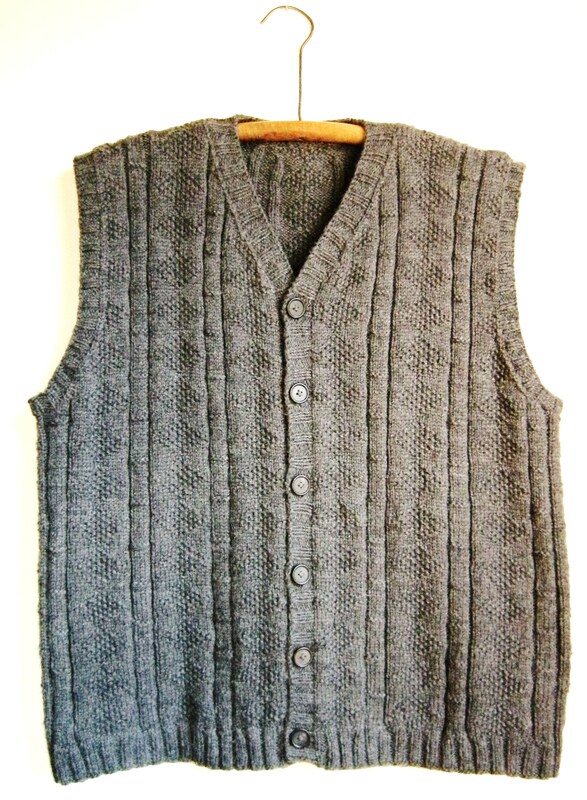 I borrowed an established traditional fisherman sweater motif, and designed this vest. 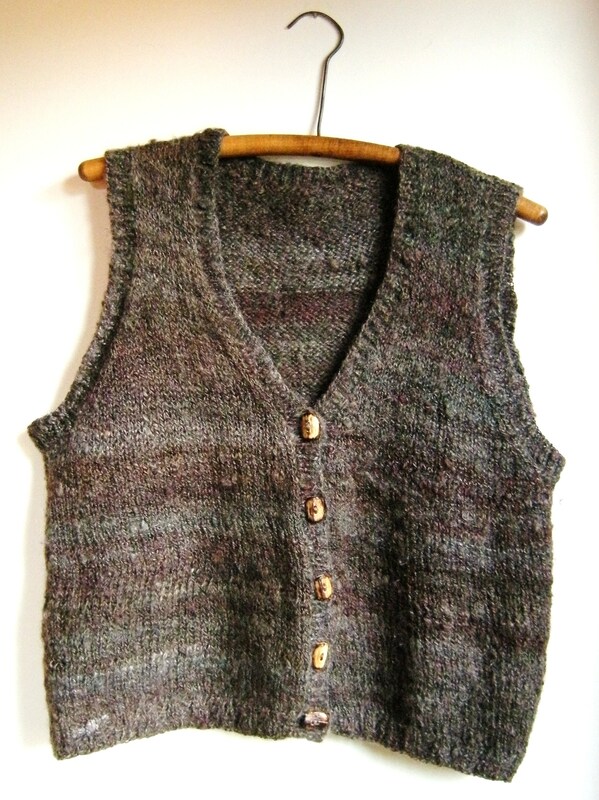 I call it the Flamborough Vest after the traditional motifs of the namesake. 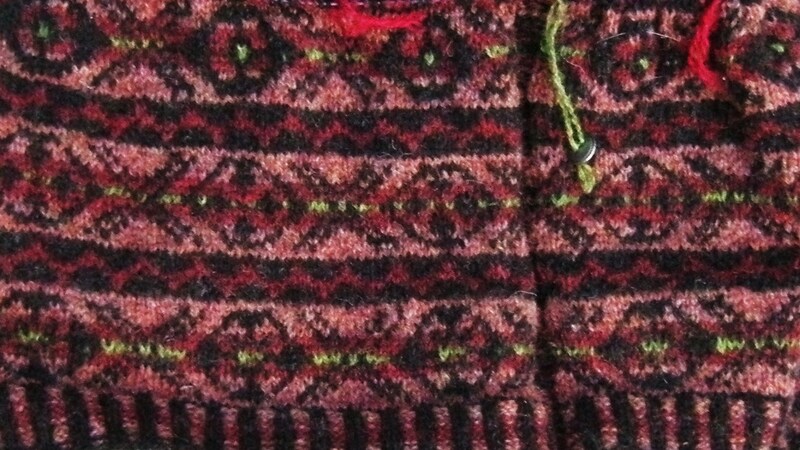 About the yarn : I would have loved more than anything to knit this vest in a real traditional wool, or even better, my own handspun, but Jeff is extremely sensitive to the touch of wool, starts to itch within ten feet of it. So I used a nice worsted weight superwash wool, and I have to say, I am surprised at the soft texture ! Not in the least bit scratchy , a one-hundred-percent wool garment. I mean it, I am totally smitten over this vest ! 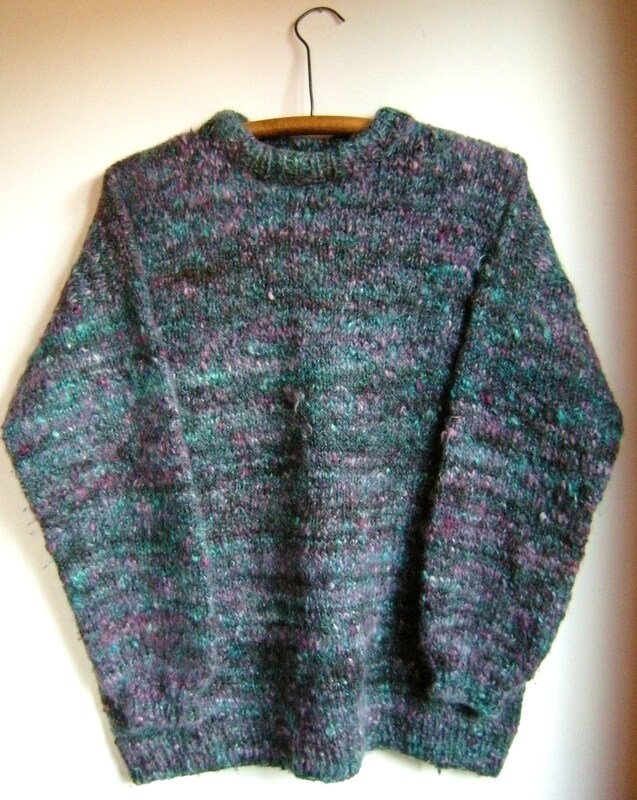 In textured knitting, I think it very prudent to choose or design a very enjoyable pattern, and with a nice yarn, so that the days, weeks, perhaps months it may take to complete the project , are at least not spent in utter boredom. I personally do not get bored while knitting, but just sayin’. 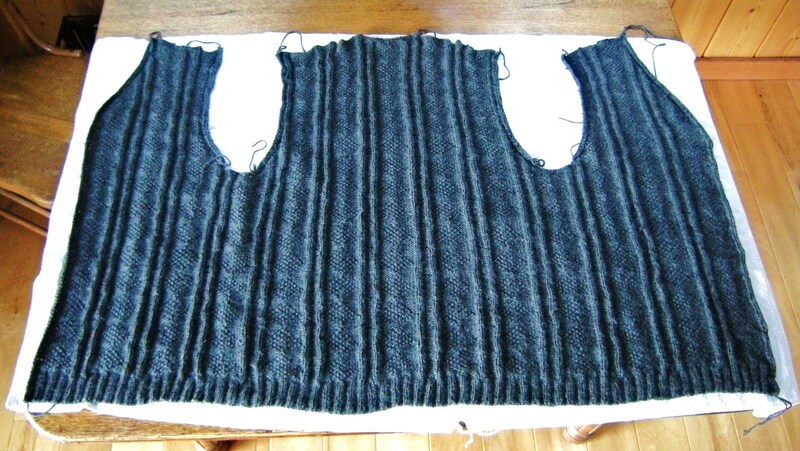 Here is my best ever vest project in progress, and enjoying every row ! 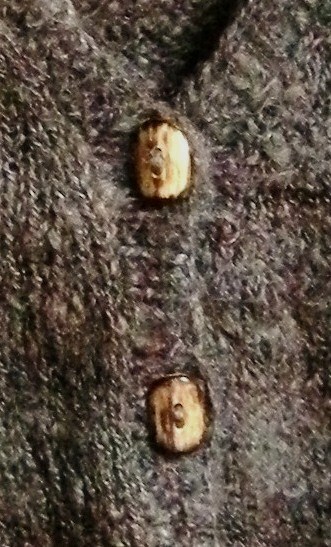 Next, sew seems and knit the button bands !